Wren longs for peace and quiet but, alas, his rambunctious family create havoc as naturally as they breathe. When a noisy baby sister joins the clan, Wren puts his foot down and moves in with his grandparents who reside in the tranquil countryside. However, it doesn’t take long before he starts to miss home, noise and all. 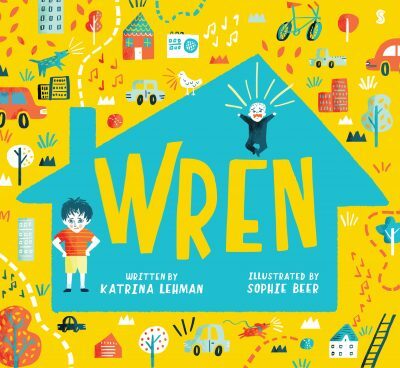 Wren is an exceptionally strong debut, with an emphasis on narrative that will appeal to fans of Julia Donaldson. Katrina Lehman’s fluid, rhythmic prose rolls off the tongue, and there are some great beats in the tale that make for a dynamic read-aloud session—including an affecting twist at the end. Illustrator Sophie Beer depicts family chaos at its most beautiful. Her style is gloriously colourful, bustling with lots of visual details to enrich the world of the story: squabbling children, wall scribbles, books strewn over the floor. The lovely endpapers continuing this theme are a bonus. Suitable for ages two and up, Wren is an easy recommendation for anyone looking for stories about families or new siblings. This book is also an excellent way to talk about the importance of giving family members space from each another.